Norwegian Landrace Pigs are the leading breed of swine in Norway. They are white and have a heavy drooped ear. Since swine are not as numerous in Norway as in most countries that have a registered strain, the number registered each year is limited. Norwegian Landrace, as well as most of the swine in Norway, are raised in the southern part of the country. Most are found in the area of Hamar. 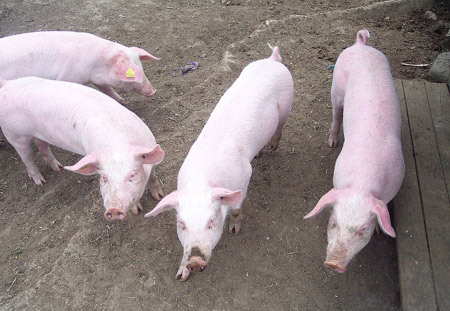 Norwegian Landrace Pigs originated from importations of Landrace from other countries. There was special selection to give the blend of introduced strains a unique adaptation to the environment of Southern Norway. The major aid in this selection has been the breed testing done in a special swine station. In the boar testing station, 2300 boars are tested annually. 2700 siblings are also tested on station. In addition, boars and gilts are tested on farm. The best performing pigs that are sound provide the main source of brood stock for breed improvement. Norwegian Landrace Pigs have become popular in other countries and are often exported. Exports have been made, to England, Ireland, Northern Ireland, France, Sweden, Denmark, Canada, Poland, and Czechoslovakia. These countries all have a reputation for producing high class pork products and most have a strain or breed of Landrace of their own.